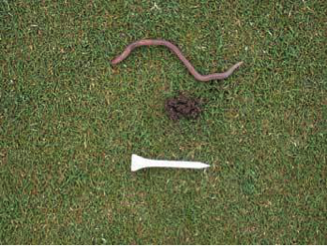 Are You Fighting Earthworm Castings? — Walker Supply Inc.
Are You Fighting Earthworm Castings? Are the above images a little too familiar? No products are labeled for earthworm control in the US or Canada, but some organics applied for other purposes may be effective. Check out this valuable research article on the Grigg Bros. website, "Using Organic Products to Reduce Earthworm Castings" written by Alec Kowalewski, Ph.D. and Brian McDonald, M.S. and published in Golf Course Management magazine. The WSI Team has observed this first-hand in the field with the use of Rhizo-Aide from Griggs Bros. Ask your Territory Manager for more information today. They can help you assess your unique situation and develop the best plan of attack!